Volkswagen have been busy updating their model range over the past couple of years. New models such as the T-Roc have arrived, whilst a new Polo will be here in early 2018. One model that has not been relaunched is the Passat CC. Instead, Volkswagen have replaced it with an all new “Sportback” model called Arteon. German saloons are remarkably popular with company car drivers in the UK, so back in 2008, Volkswagen launched a new top of the range Passat & called it the Passat CC. Aimed specifically to compete with Audi’s A4, BMW’s 3 Series & the Mercedes-Benz C Class, it sold a respectable 6,948 units in the UK in 2011. But, by 2016 this figure had dropped off as the model started to show it’s age & in late 2017 it was replaced by the Arteon. 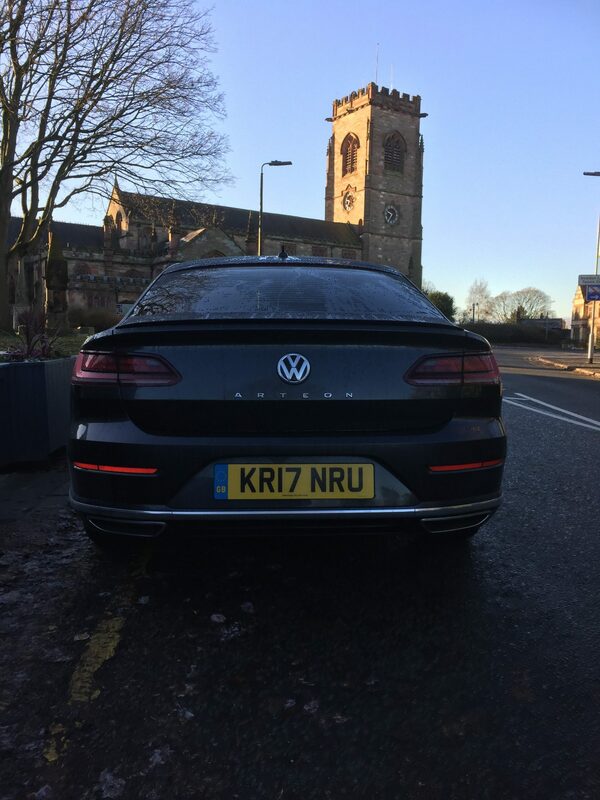 Despite the popularity of SUV’s & Crossovers, Volkswagen obviously believe that there is business to be had in this sector & have made a bold move by introducing the Arteon as a direct competitor to the BMW 4 Series Gran Coupe & Audi A5 Sportback. There’s a choice of two Arteon models. Entry level Elegance or the more expensive R-Line. We were testing the R-Line 2.0 litre petrol 190PS DSG version of the Arteon. Without a doubt, the Arteon is an attractive car. Sleek, narrow LED headlights merge into the large wide front grille which stretches across the whole of the front of the car. There are lovely chrome edged frameless windows above the neatly sculpted flanks & the rear lights curve nicely into the boot. The Arteon is bigger then the CC it’s replaced, measuring 4862mm long by 1,871mm wide, but it’s only 1,450mm from the tarmac to the roof, which gives it a real coupe look. This compares with the more staid VW Passat saloon which comes in at 4,767mm x 1,832mm x 1,476mm. 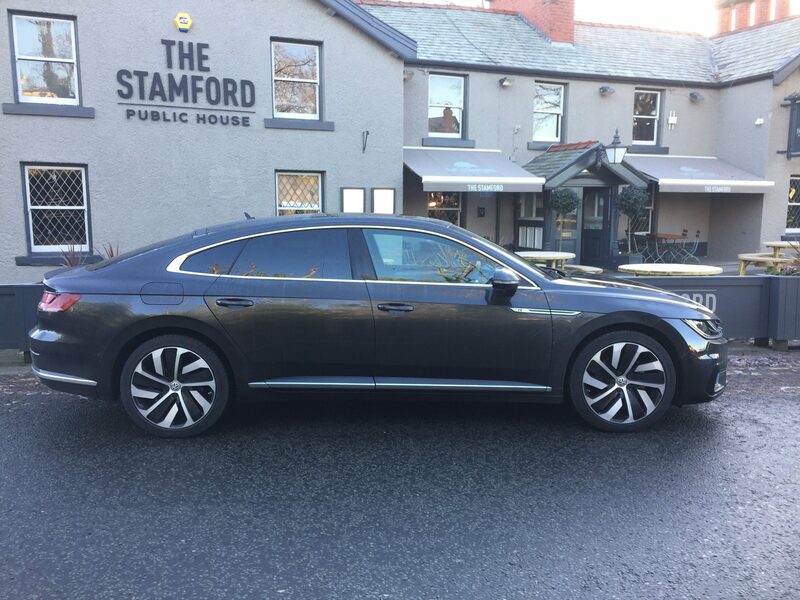 Despite being larger on the outside than the Passat, it’s fastback design means that there’s less head room in the Arteon than there is in the Passat. 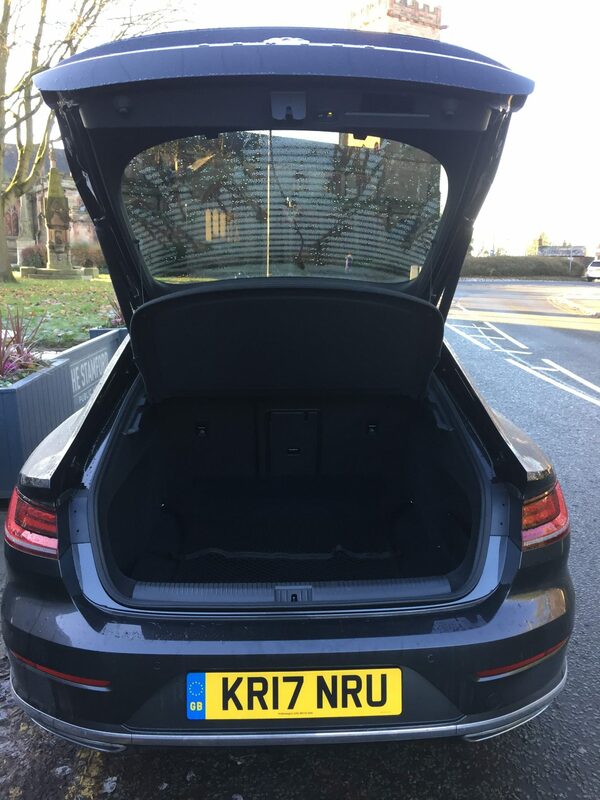 The Arteon’s boot offer’s 563 litres to the owner & with the rears seats folded flat, this increases to a very useful 1,557 litres, only 23 litres les than the Passat. The interior is very stylish with soft-touch plastic & a high quality finish throughout. The ventilation slot that runs the full width of the dash is shaped to mimic the Arteon’s front grille. VW’s Active Info display sits right in front of the driver. This takes the place of traditional analogue instruments & it both look’s good & work’s well. The system allows the driver to view a variety of information, including the SatNav, vehicle data & telephone information & with it sitting right in front of the driver, it means that the driver doesn’t have to take their eyes off road. The cabin in the R-Line is finished with a black roof lining &is quite dark. Luckily, fitted to our test model, there was a sun roof which on a sunny November day made it much brighter in the cabin. If you’ve driven any VAG model, the switchgear is reassuringly familiar from model to model. This too is true of the Arteon. The front & rear seats are almost bucket like in style & consequently very supportive. Although you’d be hard pressed to get an adult to sit comfortably in the centre seat in the rear, the other two rear sets come with great legroom, but with the Arteon’s slanting roof line, the head room is compromised. Entry to the rear though is actually very easy. The 2.0 litre petrol engine fitted to our test car has a top speed of 149mph & will go from 0-62mph in just 7.7 second’s. The DSG gearbox is excellent meaning that the Arteon is great fun to drive, hugging corners & with a nice turn of pace when required. Unsurprisingly, the Arteon likes motorways. It’s smooth & with extra insulation, quiet in the cabin at high speeds & guaranteed to land you safely at your destination feeling relaxed & happy. There’s no doubt that the Arteon provides a great deal of comfort for its occupants. I had a car full of rugby players to bring back from a game in Liverpool. After the journey I asked the group their thoughts on the car’s comfort & all were in agreement that it rides smoothly, so much so that two fell asleep in the back seats. For customers who wish to play, the Arteon comes with a choice of four driving settings; Eco, Normal, Comfort & Sport. 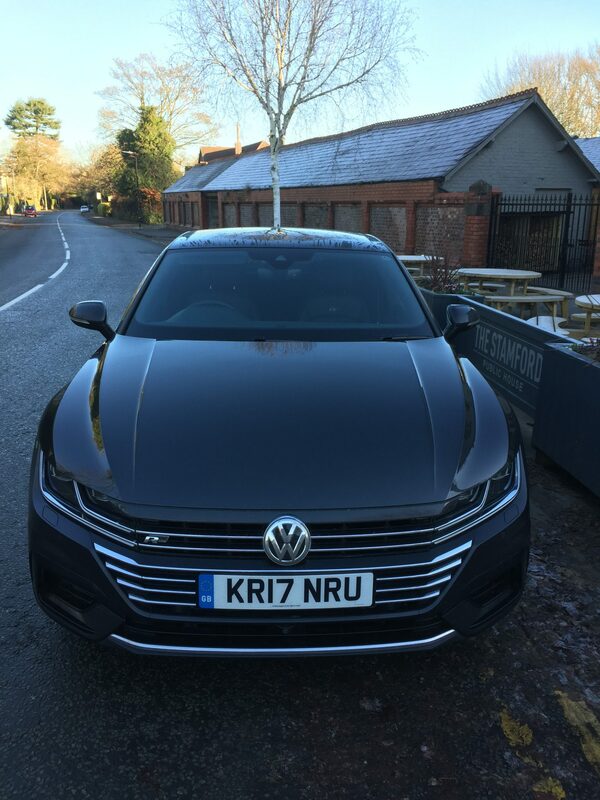 I utilised “Eco” for my week in the Arteon, primarily to see how I would get on with fuel economy. Volkswagen claim that the combined mpg on our test car is 47.1 mpg. We drove the Arteon on a mixture of urban extra urban & country roads for over 500 miles & we managed to just scrape over 32mpg, which is some way shy of the claimed figure. In fairness, the DSG gear box & sheer power on offer from our 190PS test car, which offers 320Nm, means that it’s almost impossible not to ‘drive’ it, which of course is a killer on economy. Emissions are 135g/km. However, the 148bhp 2.0 TDI diesel is expected to be the most popular model sold in the UK & it offers a better claimed economy of 65.7mpg on the combined cycle, with C02 emissions of 112g/km.This means you could expect a BIK rate of 24%, which means a tax bill of £3,138 for higher rate taxpayers on this models cost price. My test model came armed with everything, including front & rear parking sensors, bi-xenon headlights with LED running lights & heated electrically adjustable front seats. 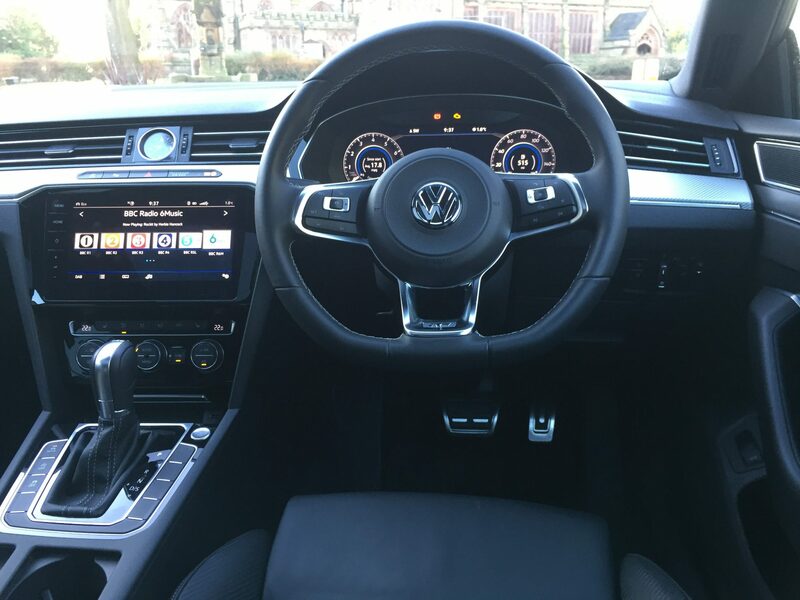 VW’s Discover SatNav with a 8” colour touchscreen is a highlight & with Car-Net providing on line access to traffic, parking & weather information, my longest trip to Surrey & back was made all the more enjoyable as I was able to circumvent some problems as I headed around the M25. Adaptive cruise control is standard & includes front assist radar sensor controlled distance monitoring, city emergency braking, road recognition cameras, a lane assist camera & the predictive cruise highlight is it’s ability to use road recognition it adjust the car’s speed on approaching road hazards such as bends & roundabouts. All very comforting. From my point of view, I think that the Arteon is a winner. It looks fantastic from every angle. Inside, it’s incredibly well specced, is supremely comfortable, is great fun to drive, is fitted with the best safety features out there & comes with class leading space. Our test car costs £33,435 OTR which I feel is great value for money. If contract hire rates are competitive, it should prove popular. From a fleet perspective and despite the so-called demise of diesel, it is the 2.0 TDI version I would choose if I were picking my next company car. Incidentally, there is a 1.5 TSI petrol version offering combined MPG pf 54.3 & emissions of 119g/km, so if your fleet policy is moving away from diesel, you will be able to choose a petrol Arteon after all.